I honestly can't remember the last time I've re-capped a weekend, but here we are :) Also, if you're a snapchatter I'd love for you to follow along with me (and leave your username in the comments so I can add you!) on Snapchat. My username is lindsaybcolvin. It was a fairly low-key weekend for us, thanks to The Masters consuming much of our time. 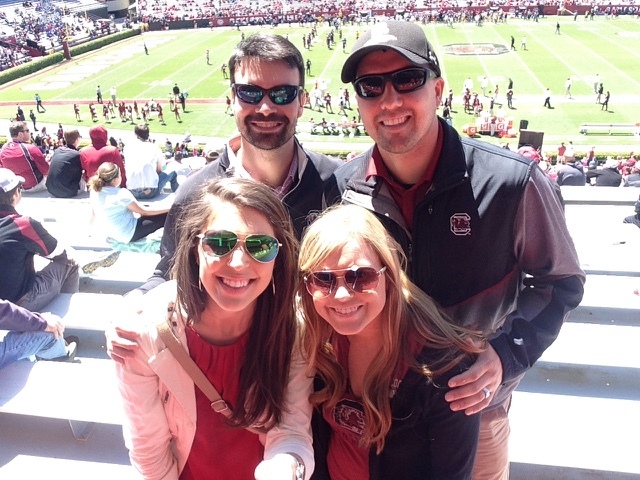 However, we did get out Saturday and head to Carolina's Spring Game with our friends Erica and Nathan. It's been unusually cool and very windy this time of year for us, so we battled the wind a little bit. But once we got in the stadium we were shielded enough from it and it warmed up a bit. We even got a touch of sun on our faces and arms. I think all four of us were in agreement that we are hoping for a better football season for our Gamecocks this year, as compared to last. Sunday we headed to church then you guessed it, back home for lunch and then to sit on the couch the rest of the day watching golf. During commercials I did manage to get our sheets washed, and took the dishwasher completely apart to clean it. I may or may not have had to call in back up to get it put back together. And I'm not going to discuss how terribly dirty it was...and to think that was washing our dishes. However, after a long, hot cycle with baking soda and vinegar, I think we are good and clean now. As I'm sure you can imagine, we are heart broken for Jordan Spieth and the way the back nine at Augusta played out for him yesterday. Truly heart wrenching. When he hit it in the water on 12...twice...Josh went flying out the back door, with his golf club in hand, he couldn't stand to watch the heart break any longer. I won't lie, when I saw him hit in the water the second time, I literally fell onto the floor. The dramatics, I know. Josh and I commit ourselves 110% to the sports we like, players we like, teams we like...and watch what happened to Jordan yesterday, you can't help but be heart broken. Obviously, a huge congratulations to Danny Willett for his win. Between being a new father, his wife's birthday being yesterday and almost not making it to the Augusta National in time to play the tournament, I feel confident in saying he is probably on cloud nine right about now, and rightfully so. We were sad to see the Masters wrap up for another year. Now we're anxiously awaiting next year's tournament and hoping, wishing, praying we get tickets! - In the same makeup stop as mentioned above, I picked up L'Oreal's Voluminous Million Lashes mascara. Also good stuff. Doesn't clump your lashes, the brush is flexible and easy to use and I can honestly see big difference once I put it on. I mention these two items above because I scour the internet reading reviews for days and weeks before I typically buy a product, and I like to pass along the things that I like and work well for me! I am SO picky when it comes to concealers lol. I will have to give this one a try soon! Thanks for sharing. Love seeing your snaps!